The central part of the kids playspace is the Little Beans Village. In a nutshell, it’s a town built for kids. By foot or by car, kids can run errands just like mom and dad or meet up with friends in the town square. Visit our service station, grocery store, firehouse, playhouse, and school. Within each of the custom-built structures, the little ones will be able to step into an exciting new world. 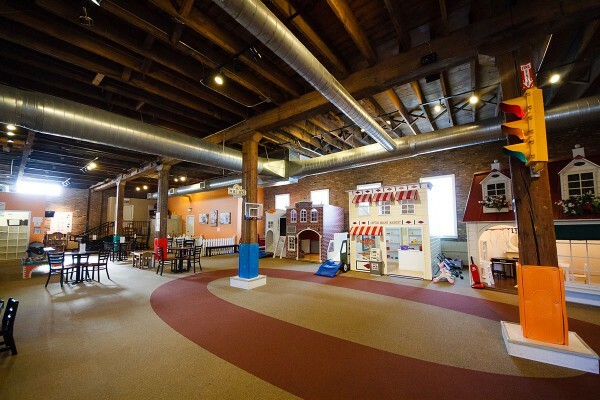 In addition, there are areas for kids to play with legos, blocks, trains and books and puzzles, as well as ride on cars and other age-appropriate toys. Socks only are required in the kids playspace (adults and kids).